To satisfy our craving for Lao food we headed over to the ‘ever popular’ Tamarind restaurant for lunch where we sampled traditional Lao cuisine in a relaxed setting nearby the Nam Khan river in Luang Prabang, Laos. Having made Thailand our base for several months, we were curious to see how Lao cuisine would compare with its ‘spicy’ and ‘sweet’ Thai counterpart. Firstly, it’s not nearly as sweet as Thai food. Coconut milk and sugar are used sparingly. 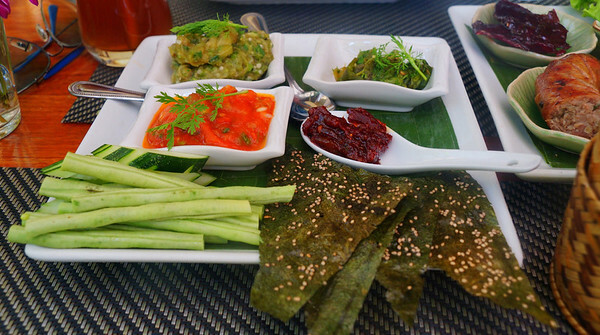 Secondly, Lao food makes more usage of herbs and natural leafy ingredients. Even meat dishes tended to be infused with copious amounts of spices and herbs. 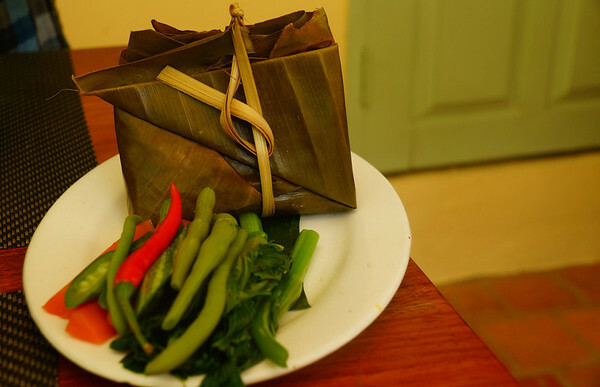 Mok Pa: similar to Khmer Amok (aside from not containing coconut milk) this herb infused steamed fish is prepared in a banana leaf and is as tender as can be! Khao Gam: how could I possible not include a dessert here? Khao Gam, is purple sticky rice with coconut milk, which is very similar to Thai sticky rice with mangoes. Buffalo Jerky: this sweet jerky was some of the most delicious ‘jerky’ I’ve ever tasted before in my entire life. Having grown up on Vancouver Island and sampling many kinds of game meat (in the form of jerky) I can honestly say that Lao water buffalo jerky trumps them all. 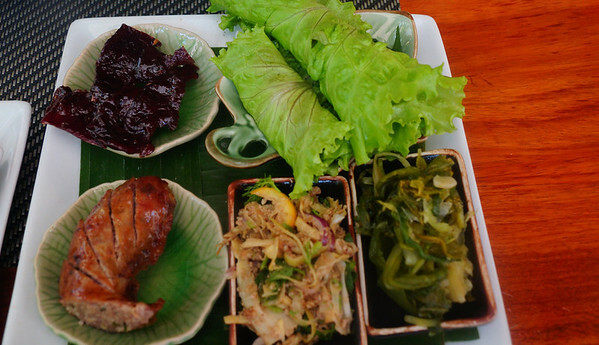 For lunch today we are eating at one of our favorite restaurants in Luang Prabang – it’s called Tamarind. 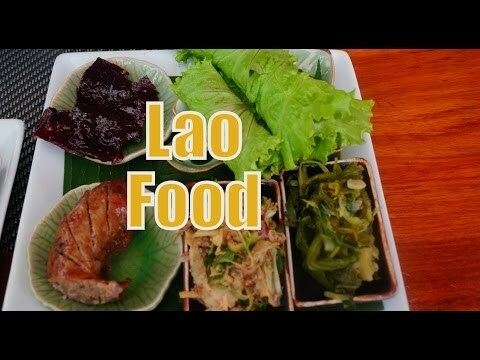 It focuses on Lao food, so we’re going to be showing you some traditional dishes. This over here is called Nam Mak Kham and it is a Tamarind cooler and you get a nice little bamboo straw and it is a really sweet and sour drink. It is refreshing but a little tart. I really like it. It’s so good! Next up we have our dipping platter. This over here is coriander pickle, next we have an eggplant dip and tomato dip. We have a paste made from buffalo skin, we have some seaweed chips and then some vegetables that we can eat with the sauce. Let’s dig in. 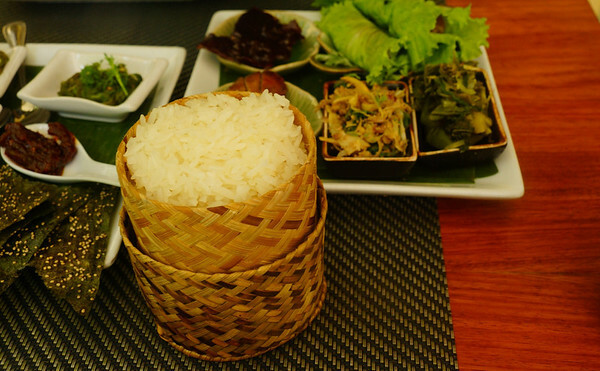 That all goes together of course with our sticky rice. Sam is going to demonstrate for us. This is how you eat it. You just kind of put together a little ball like that and then you can pick a different dip. I’ll try the buffalo sauce here. You put it together just like that and you pop it in your mouth. Delicious! Is it a bit spicy? Oh yeah! This one is really spicy. Finger food! Finger food! That is a huge ball. Little ball. That is not little. Okay, I will go with the aubergine. She has got her happy face on. It is so good. It is not just aubergine. They’ve added spices – there is coriander, onions – there is just an explosion of flavors. This is the second plate we’ve ordered. Again, here we have a vegetable pickle, this is a pork salad that also has banana flowers, we have a pork sausage and here is some buffalo jerky – Sam’s favorite. Oh, yeah! Over here we have some little lettuce rolls that are stuffed with different dips, different sauces, so we’ll be trying those. Buffalo jerky time! I’ve broken off a little piece of this buffalo jerky and this is my favorite. Chewy, right? Yeah, it is very chewy like any kind of jerky but this is probably the sweetest jerky I’ve ever had. I can’t remember ever tasting anything quite this sweet in jerky form. You have this lettuce leafy roll over here. I taste lemongrass and something sweet like a yam almost but I’m really not sure what it is. It could be some local thing. We’ve ordered so much food we almost forgot about this next dish. It is time for me to do the honors. I’m going to unveil our steamed fish, which comes wrapped in a banana leaf. It is called Mok Pa. Let’s see what is in here. It’s like opening a present. I know, it’s like Christmas on a plate. Oh, Wow! There it is. You can see the steam coming off of it. It is going to be good. It comes with a side of vegetables, so let’s not forget about those. Time for a taste test. First bite! Wow! This is cooked in a dill and basil sauce. It just melts in your mouth. It is so soft and so flavorful. It is delicious! Now for dessert we are having something that is called Khao Gam. 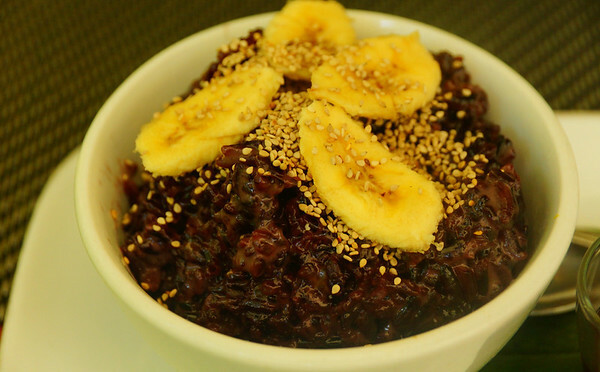 It is purple sticky rice that has been cooked in coconut milk and it also has banana and sesame seeds on top. Down here! It looks amazing! If that weren’t enough, we get a little shot of Tamarind sauce which we can pour over top. I’m going to try it the natural way without the tamarind sauce first. It is so fragrant. Nice and sweet? Very sweet. You can definitely taste the coconut and it is a nice sticky rice with a bit of a nutty texture. I like it. Let’s try this with some tamarind sauce and a big chunk of banana. Oh my, it is so good. The tamarind gives it a kick and a bit of spice. It is still really sweet. That splendid feast came to just over $18 USD, 151,000 Kip which we think was excellent value. It is a bit of a gourmet type of restaurant. It is right by the river. You’ve got awesome views from here. Oh, everythings looks so so delicious! Great post! Take care and have wonderful time in Malaysia! Wow, the Lao cuisine is making me hungry! Incredible food. Thanks for the yummy insights. I’m missing it these days (having just left last week). Asian food all have similar basic ingredients, which I absolutely love. One of the first things I do when I visit the continent is eat. That’s like my biggest motivation to travel that way. Haven’t specifically tried Lao food, but I’ve tried Cambodian food, which I assume would be very similar. Lucky you guys! Mmmmm….buffalo….first had the jerky-kind in Nepal then again in Laos, and it’s just so good! The best thing I ate in Laos was chicken fried rice that was wrapped and had been cooked in banana leaves…super simple but absolutely delicious, especially after a 7-km trek through the mountains outside LP. Thanks for sharing and glad you’re enjoying Laos! I love your videos but especially the foodie ones!! I’m starving now. The food looks perfectly delicious. I especially am interested in trying the Buffalo jerky on my first trip. Can’t wait. Y’all be careful out there and keep up the great work!!! If you’re a big jerky fan you’ll absolute love the Laos water buffalo jerky! Yum… it looks so delicious. I can’t wait to travel Asia next year – the food there is possibly the best in the world! The Mok Pa and Buffalo jerky were my personal favorites. As a jerky fan you would have loved the Lao version – it’s more sweet and tender than most! That’s awesome Barbara! We took a cooking class in Luang Prabang, as well, and loved it! The food sounds amazing! Have not tried Thai or Lao cuisine before, but Lao sounds like it would be more up my street. Buffalo skin – my god. Haha, I love strange sounding dishes like this. Making my way to Laos in June this year and can’t wait to try out the cuisine, never been a full out foodie, but Asia has taught me well. cheers man! How tasty does that look! Excellent value too.. I cant explain how envious I am, I cannot wait to travel!